For good free improvisation three things are required. First, musicians who are masters of their instruments, next, players who have created their own language, and, finally, performers who are simpatico. The first prerequisite is obvious, unless of course you were able to appreciate Ornette Coleman when he took up the violin without first learning the instrument. The last two requirements are bit more debatable. Developing a unique musical language while not requisite to playing free, does t have a value-added component. Think of the sound of Derek Bailey. His sound is so unique, it is both unmistakable and an ideal vehicle for improvisation. Lastly, players who are sympathetic, supportive of their mates, make better music. Sure, it can be argued that the uncongenial fly in the ointment fosters creativity, but that kind of tension only goes so far before the ideas stop. 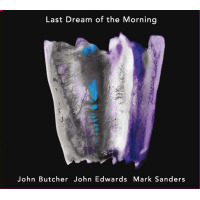 If you agree with me so far, this recording between the British musicians, saxophonist John Butcher, bassist John Edwards, and drummer Mark Sanders is an exemplar of great improvisation. The three have been playing together in everything from large ensembles to duos for many years. Edwards and Sanders are often (or should be) spoken of as a team, and can be heard with the the likes of Evan Parker, Tony Bevan, Veryan Weston, John Tilbury, Frode Gjerstad, and Paul Dunmall. Together with Butcher, it is quite easy to hear each player anticipate the next sound or movement and each is ready to advance the sound. Luckily, when you experience the five pieces presented here there is that interplay, a conversation between improvisers that provides nourishment to both the listeners and each player. Butcher's saxophone sound, like that of Evan Parker, is distinct and identifiable. He blows overtones revealing sonic textures that have body. It's corporeal. The same is true for Edwards' bowed bass that lifts the platform of the music, and Sanders, who like any great percussionist, strikes just the right blow at the correct moment. This music is about the instant. Creation from decades of practice that appears like a lightning strike. Track Listing: Lucid; Syphon; Sand Dance; Signal; Gridlocks. Personnel: John Butcher: saxophones; John Edwards: double bass; Mark Sanders: drums.